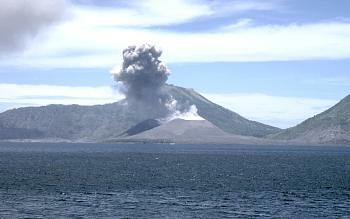 Eruption column caused by a vulcanian-type explosive eruption rises above Tavurvur Volcano in Rabaul Caldera, Papua New Guinea. Credit: J. W. Ewert / U.S. Geological Survey. A vulcanian eruption is a type of explosive eruption that ejects new lava fragments that do not take on a rounded shape during their flight through the air. This may be because the lava is too viscous or already solidified. These moderate-sized explosive eruptions commonly eject a large proportion of volcanic ash and also breadcrust bombs and blocks. Andesitic and dacitic magmas are most often associated with vulcanian eruptions, because their high viscosity (resistance to flow) makes it difficult for the dissolved volcanic gases to escape except under extreme pressure, which leads to explosive behavior.